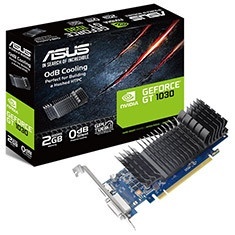 The ASUS GeForce GT 1030 graphics card features a low profile design, passive cooling, 1266MHz base clock with a 1506MHz boost clock, 2GB 64-bit GDDR5 memory, PCI-E 3.0, OpenGL 4.5 support, DVI-D and HDMI. Engineered with a highly-efficient 0dB thermal design, it dissipates heat in complete silence — making the GT 1030 the perfect choice for your slimline home-theatre PC build. Backed by a 3 year ASUS warranty.